Go for a walk in the woods on any given summer day, and you'll see fungi galore popping up, nestled in amongst the ferns and trees. After a rainstorm, peek out in your backyard and you may see tiny spores beginning to sprout in the grass, forming what's known as a fairy ring. Mushrooms grow in all shapes and sizes and colors, and - depending on where you live—you might find some that are conducive to magical practice. It is important to note that unless you are absolutely positive about the type of mushroom you have picked, you should never ingest it or take it internally. There are many toxic mushrooms which look similar to edible ones—if you're unsure about what you have found, check with a naturalist or other mushroom expert. That having been said, there are a number of folk magic uses for mushrooms, and you can incorporate these at a symbolic level, rather than actually ingesting them. 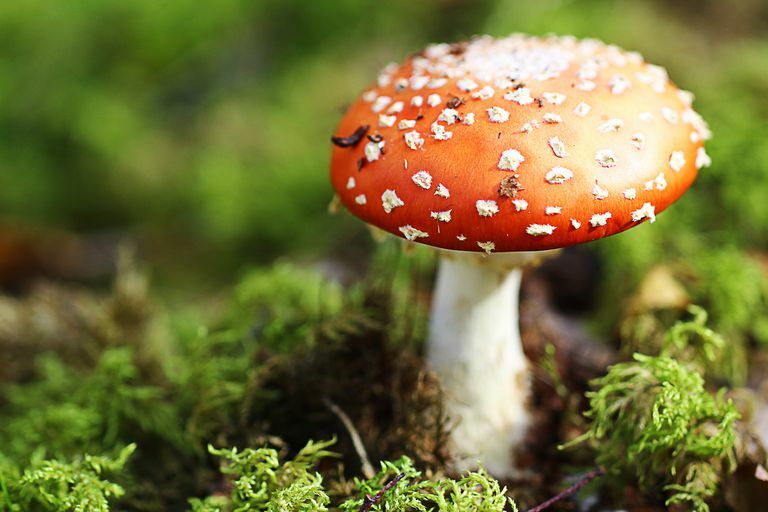 Let's take a look at some of the legends and myths about mushrooms from around the world. In many areas, the appearance of a ring of mushrooms on the ground is cause for either rejoicing or alarm. In Great Britain, these circles are known as fairy rings—and they are where the Fae come to dance and frolic after a rainstorm. However, like many other locations associated with faeries, humans who dare to enter such a ring may find themselves asleep for a hundred years, or worse yet, whisked off to the land of the wee folk, never to return. In Holland, these rings are believed to be left when the Devil sets down his milk churn—once he picks it up, there's a big circle left in the grass. In some countries, such as France and Austria, these rings are associated with sorcery and malevolent magic, and travelers are well-advised to steer clear of them. Vance Randolph says in his book Ozark Magic and Folklore that in many parts of the Ozarks, it is believed that "mushrooms must be gathered when the moon is full—gather 'em at any other time and they will be unpalatable, or perhaps even poisonous." He adds that it is said that mushrooms growing in an orchard where apple trees are in bloom are always edible. One of the best-known mushrooms, at least in European culture, is the red-and-white Fly Agaric. This mushroom appears often in illustrations of fairy tales—you might see a gnome or a fairy perched on top of one. Experts believe that the Fly Agaric was used as a hallucinogenic by northern European shamans and religious leaders. Interestingly, it contains two toxins that reduce the body's response to fear stimulus, so it may have been ingested by warriors prior to battle. In central Europe, the Fly Agaric is associated with the Yule season, and there is a theory that Santa Claus' red and white suit originated in the colors of this magical mushroom. Erika Timar of Supernaturally Speaking says, "There are numerous beliefs about the origin of the mushroom. In one story God and Saint Peter are walking in a rye field. Saint Peter grabs a stalk of rye and chews it. God chastises Peter saying the rye is not for him and he should spit it out. Peter complies and God states, “A mushroom will grow from that grain. Let it be for the poor.” In Lithuania, mushrooms were considered the fingers of Velnias, Lithuanian god of the dead, reaching out from the world of the dead to feed the poor." In ancient Egypt, mushrooms were a rare delicacy indeed. They were associated with immortality, and as such, only royalty could consume them—because, after all, royal persons were descended from the Egyptian gods themselves. Hieroglyphs found in Egypt indicate that mushrooms were being consumed with meals as long as 4,500 years ago. In China and Japan, mushrooms were associated with longevity and strength—partly because some of the most popular mushrooms that grew there were known for stimulating the immune system. Shiitake and maitake mushrooms, in particular, have been used in herbal remedies for centuries. Mushrooms have been used by many cultures throughout time as part of ritual and religion. The toxin psilocybin is found in certain mushrooms, and the use of hallucinogenic fungi has been documented in rituals dating back thousands of years.